Carbon fiber can be processed at a much higher throughput than is possible with conventional methods. Researchers at Oak Ridge National Laboratory (ORNL) in the US have demonstrated a carbon fiber production method that could reduce the cost of carbon fiber by as much as 50%. The energy used in its production could also be reduced by more than 60%. More than 90% of the energy needed to manufacture carbon fiber composites is consumed in making the carbon fiber itself. However, a reduction in energy consumption in manufacturing could enable earlier net energy payback with regards to the energy savings gained in using products made from lighter-weight material compared to the energy consumed in making the material. Carbon fiber is produced by converting a carbon-containing polymer precursor fiber to pure carbon fiber through a carefully controlled series of heating and stretching steps. In current commercial practice, the polyacrylonitrile (PAN) precursor is chemically modified and optimized to maximize the mechanical properties of the end product. However, specialty precursor materials and the energy and capital-intensive nature of the conversion process can lead to increased cost. However, acrylic fiber with a similar chemistry could also be used a high-volume product that costs roughly half as much as the specialty PAN used in the carbon fiber industry. 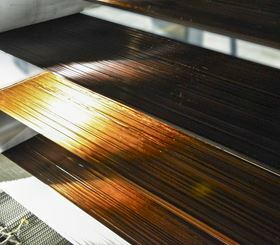 ORNL’s new lower cost method, demonstrated at its Carbon Fiber Technology Facility, builds on more than a decade of research in the area and could accelerate the adoption of carbon fiber composites in high-volume industrial applications including automobiles, wind turbines, compressed gas storage and building infrastructure. ORNL has now made the new method available for licensing. ORNL is also working as a technology partner in IACMI – The Composites Institute to enable the use of low-cost carbon fiber composites in a wide range of clean energy products, including offshore wind turbines that can lower the cost of electricity to high pressure tanks for the storage of natural gas. This story uses material from Oak Ridge, with editorial changes made by Materials Today. The views expressed in this article do not necessarily represent those of Elsevier.